Bill Jackson Roofing is a locally-owned and operated roofing company in Elyria with nearly three decades of experience in the roofing industry. Our commitment to quality work and customer service has helped us become a preferred roofing contractor in Northeast Ohio. We provide complete roofing services for both residential and commercial applications. Our specialty is asphalt shingle roofing and we also offer custom sheet metal services. Beyond our roof repair and replacement services, we also provide a variety of exterior home improvement solutions, such as siding, gutters and replacement windows. In 1996, Bill Jackson, along with a few friends, performed roofing work while going to college part-time. 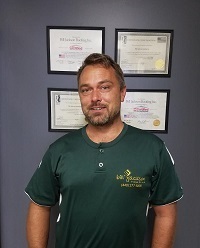 Driven by the dream of being an entrepreneur, Bill founded a roofing service company in Lorain County, Ohio and turned his passion into a reality. Several years later, our company is still locally-owned and focused on delivering the best service and options to our clients through continuing education on roofing products and installation training for our crews. Our customers include homeowners as well as the area's best custom home builders and condo associations. Bill Jackson started roofing in 1992 and founded Bill Jackson Roofing in 1996. Bill has always taken great pride in his work and reputation. He was born and raised in Sheffield Lake where he now raises his two boys (Chas and Brenden). Bill is extremely involved in the community and has sponsored youth sports as well as coached his son’s soccer and baseball team for several years. Bill runs this business with a few simple philosophies: surrounding himself with motivated and knowledgeable individuals and creating a company culture that his employees can be proud to be a part of. They did a wonderful job, the roof looks great! I was surprised how quickly the work was. I think that the online roofer concept is excellent. I had never had a roof replaced before and was kind of hesitant about how to go about the whole process. The online service and a few conversations with you made the whole process comfortable and educational for me. I would definitely recommend Bill Jackson Roofing to anyone that needs a roof. We've been recognized for our commitment to quality service with an A+ rating from the Better Business Bureau (BBB) and Super Service Award from Angie's List. We have also been selected to be an Owens Corning Preferred Contractor, which allows us to provide our customers with one of the best warranties in the industry.